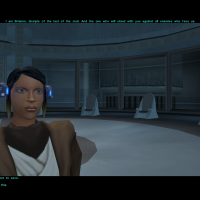 As much as I love KotOR II: TSL, I have always been disappointed by the lack of same gender romance options with any of the party members. 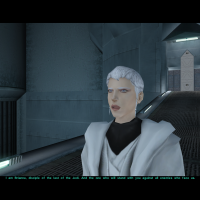 Granted, TSL never had any fully developed romance arc to begin with, but given KotOR1 at least has Juhani as a lesbian romance option even though her romance has less content (and is much easier to miss) compared to Bastila's or Carth's, the lack of same gender romance options in TSL is disappointing, in my opinion. My Visas Marr and Female Exile Romance as well as Atton Rand and Male Exile Romance mods had been made and released as part of my same gender romance mod project for TSL, now I present to you the next and the biggest part of my project: Handmaiden Handmaiden and Female Exile - Disciple and Male Exile Romance mod! This mod makes the Handmaiden a romance option for female Exiles, and the Disciple a romance option for male Exiles. 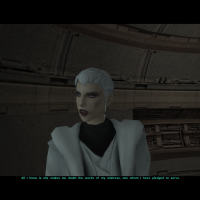 Players do not need to worry about any possible pronouns mix-up either because this mod will make the Handmaiden refer to a female Exile by "she/her" and the Disciple refer to a male Exile by "he/him". If a female Exile has much higher influence with Visas than the Handmaiden, the Handmaiden vs. Visas jealousy/rivalry cutscenes will be triggered (however, be warned that this will also make the Handmaiden refuse to speak to the player for the rest of the game). 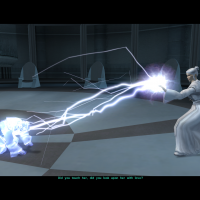 Similarly, if a male Exile has much higher influence with the Disciple than Atton, Atton vs. the Disciple jealousy/rivalry cutscenes will be triggered. After installing TSLRCM, extract the Hand_Disc_SameGenderRomances.zip you downloaded to anywhere you like, as long as it is not within the KotOR 2 directory. Default Installation: This option will make the Handmaiden join a female Exile and the Disciple to join a male Exile automatically. Players will not need to do any extra actions for it to happen. However, this option does not allow players to recruit both the Handmaiden and the Disciple in a single playthough. WARNING: If you choose this installation option, male Exiles will not be able to recruit the Handmaiden. Similarly, female Exiles will not be able to recruit the Disciple. 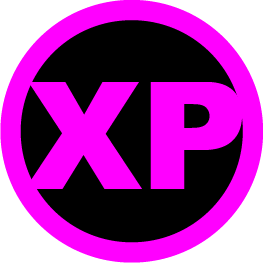 PartySwap Compatible Installation: This option is for players who have installed DarthTyren's PartySwap mod, which allows players to recruit both the Handmaiden and the Disciple in a single playthrough regardless of the Exile's gender. I take full responsibility for any possible bugs or issues with the "PartySwap Compatible Installation" option of this mod. Please make sure you have installed PartySwap first BEFORE choosing this installation option! When you install my mod, if you got an error message that says along the lines of "[ERROR] Unhandled exception: Access violation at address [a bunch of numbers]. 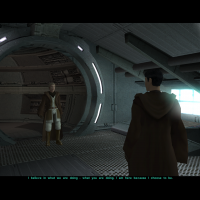 Write of address [a bunch of numbers] (0)", try right-click your KotOR 2 folder or subfolders, go to Properties and uncheck the "Read-only", then try to install my mod again to see if it works. Please read the Compatibility Patch ReadMe.rtf file within the folder and follow the instructions to make these mods work together without conflict. STEP 2: Go to the "backup" folder created by the TSLPatcher from this mod, cut and paste disciple.dlg , kreia.dlg and mira.dlg into your override folder. STEP 3: From the "backup" folder, cut and paste 003EBO.mod, 006EBO.mod, 262TEL.mod, 301NAR.mod, 303NAR.mod, 402DXN.mod, 610DAN.mod, 650DAN.mod, 907MAL.mod, 908MAL.mod, 909MAL.mod and 950COR.mod into the Modules folder in your KotOR 2 directory. STEP 4: From the "backup" folder, cut and paste 003EBO_loc.mod, 262TEL_loc.mod, 301NAR_loc.mod, 303NAR_loc.mod, 402DXN_loc.mod, 650DAN_loc.mod, 903MAL_loc.mod and localization.mod into the lips folder in your KotOR 2 directory. STEP 1: Cut and paste disciple.dlg, kreia.dlg and mira.dlg into your override folder. STEP 2: Cut and paste 003EBO.mod, 006EBO.mod, 262TEL.mod, 301NAR.mod, 303NAR.mod, 650DAN.mod, 904MAL.mod, 907MAL.mod, 908MAL.mod and 909MAL.mod into the Modules folder in your KotOR 2 directory. 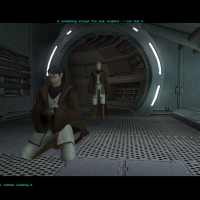 STEP 3: Cut and paste 003EBO_loc.mod, 262TEL_loc.mod, 301NAR_loc.mod, 303NAR_loc.mod, 903MAL_loc.mod and localization.mod into the lips folder in your KotOR 2 directory. Please note that these steps will not uninstall PartySwap. If you want to uninstall PartySwap, you need to follow the instructions from the PartySwap mod. 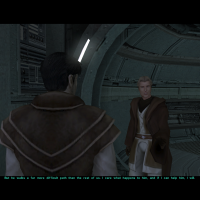 If you install PartySwap and then this mod with the "PartySwap Compatible Installation" option, play a female Exile and the Disciple joins your party, after your post-Rebuilt Jedi Enclave conversation with Visas, the scene where the Disciple warns Carth or Cede about the Telos attack will not be triggered. Unfortunately, as with my Visas Marr and Female Exile Romance mod, I am unable to find a reliable way to solve this issue. If you find any other bugs or problems, please let me know. The exceptions are TSLRCM (which is required for this mod to work), M4-78 Enhancement Project, PartySwap and Extended Enclave, as long as you follow my instructions in the "INSTALLATION" section above. 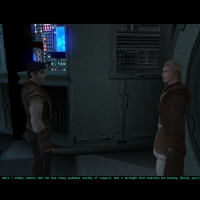 If you want to use my Atton Rand and Male Exile Romance mod alongside this mod, install this mod first then install Atton Rand and Male Exile Romance mod. 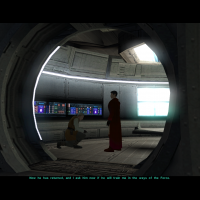 If you want to use Kexikus' Full Jedi Council mod alongside this mod, install my mod first then install Full Jedi Council mod. If you want to use JC2's Train the Handmaiden mod alongside this mod, install my mod first, then install Train the Handmaiden mod, regardless if you have PartySwap installed or not. This mod is not compatible with any other mod that involves putting the holorec.dlg file in the Override folder. 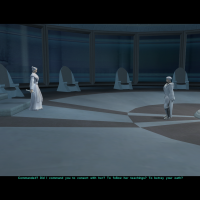 If you want to use this mod, make sure you DO NOT have holorec.dlg in your Override folder, or Handmaiden will not be able to join your female Exile's party. 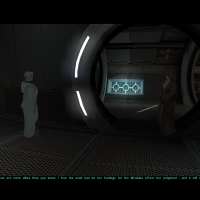 This mod is compatible with the KOTOR 2 Community Patch (compiled by A Future Pilot). If you're uncertain if a mod is compatible with this mod or not, feel free to ask me. This mod also makes changes to the same files modified by my Visas Marr and Female Exile Romance mod. Namely, this mod also makes the Visas romance scene trigger for female Exiles, while Disciple will replace Visas in said scene if you play a male Exile. Unless you want the Visas romance scene available for both male and female Exiles, if you install this Handmaiden and Female Exile - Disciple and Male Exile Romance mod, you will not need to install Visas Marr and Female Exile Romance mod.